Andy Warhol created “Empire” in 1964. Empire is a silent film consisting of 8 hours and 5 minutes of continuous, slow motion footage as a portrait of the Empire State Building in New York. Warhol forbid abridged showings, such as this 10 minute excerpt and conceptually the boredom and restlessness of the viewer is an important part of the piece. The work is an extension of Warhol’s earlier work, Sleep from 1963. Oddly enough, the projectionist Rob Trains mixed up the order of the reals and timing for the origional 8 hour showing. After the New York Times gave it a positive review, Warhol actually liked the mistake and continued to show the film with Trains mixing for the duration of the theater run. The film was made the night of July 25th from 8:06 PM to 2:42 AM the following morning. It was shot from the 41st floor of the Time-Life Building in the Rockefeller Foundation offices. It was shot at 24 frames per second but it is viewed at 16 so the viewer is looking at the film in slow motion (also extending the viewing time by an hour and a half). 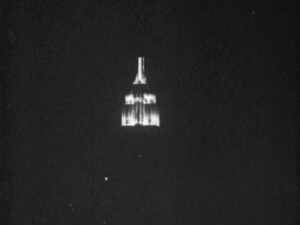 The full film begins with an over-exposed white screen and as the sun sets, the image of the Empire State building appears. The floodlights come on and flickr for the next 6.5 hours. The floodlights go off again ending the film in complete darkness. The filming was done by Andy Warhol directing and Jonas Mekas as cinematographer. During 3 of the film changes, filming began before the lights went out in the office and the faces of Warhol and Mekas can be seen in the reflection of the window the film was shot through. A legitimate release on VHS in association with the Andy Warhol Museum was released in 2000 and contains an excerpt of only 60 minutes. The film was projected in its entirety on an external wall of the Royal National Theatre’s fly tower in London. Its also been screened in its entirety in 2010 at the Varsity Theater in Chapel Hill, NC with live musical accompaniment by the University of North Carolina at Chapel Hill’s Ackland Art Museum and Interdisciplinary Program in Cinema. And its been projected in its entirety in 2013 at the MIC (Museo interattivo del Cinema) in Milan, Italy. In 2004, Empire was added to the National Film Registry in the Library of Congress in recognition of the cultural, historical and aesthetic significance of the movie, as well as the risk of the original movie reels “no longer being preserved”.